The experience I will share with you may help to bring “channeling“ into focus and reveal its demonic nature. 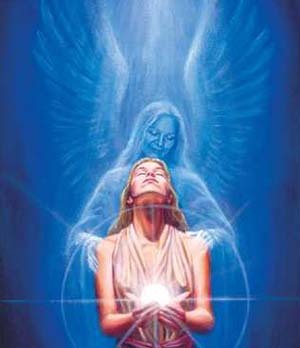 Channeling occurs when someone permits a spirit entity to possess him or her, usually in order to receive some type of psychic knowledge or power such as healing. Or an “entity“ uses the person’s voice to give spiritual teachings or practical advice. There are also other forms of spirit communication by channeling, for example, automatic writing and inner voice dictation. A very close relative, G.L., became an adept of the New Age Movement by reading the books of Alice Bailey. I was wary of the New Age and her works, but I did not understand how dangerous she was until I heard a cassette warning about the danger of the New Age Movement in general, and of Alice Bailey in particular. Bailey founded the Lucifer Publishing Company in New York City in 1922, and renamed it the Lucis Publishing Company in 1923. 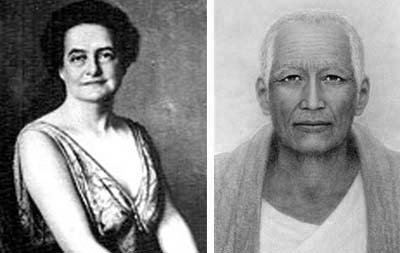 Between 1922 and 1949, Bailey published 24 books of "revelations" that she claimed to have channeled from the Tibetan ascended "spiritual master" Djwhal Khul. At my next visit to my relative, I learned that she had all the books of Alice Bailey and believed every single word she ever wrote. G.L. gave me some of Bailey’s books and I stayed up all night reading them. It became clear what was planned for us Catholics if we stayed true to our faith and refused to the join the New Agers. A few years later, my father was dying and I was back in Detroit staying at my relative’s home. She had been speaking at the Detroit Yacht Club about “past life experiences,’ that is to say, reincarnation. She asked me to listen to a tape record made of her speaking under the influence of her “ascended master,” in other words, she was “channeling” him. The first thing I noticed was that it was G.L.’s voice, but the vocabulary was on a much higher level. Even though G.L. never expressed herself philosophically, under the influence of that “master,” she definitely did. There was clearly a presence there. These “ascended masters” are believed to be enlightened beings who through past incarnations have undergone a process of spiritual transformation that fulfilled their Dharma (divine plan). They come to earth by choice to serve as teachers of mankind to direct them in the same spiritual evolution. It was one of these “masters” who telepathically dictated many of the esoteric teachings in Bailey’s books. The “ascended masters teachings” derives from the theosophical concept of the “masters of wisdom,” first referred to by Helena Blavatsky in The Secret Doctrine: The Synthesis of Science, Religion and Philosophy. Blavatsky, who influenced John Paul II, had her own spirit guide. There is a hierarchy among these “ascended masters,” with lower “masters” under the guidance of still higher spirit-entities known as the “enlightened ones” (the Three Buddhas), who are under yet another spirit called Sanat Kumara (“the lord of this world”). It is a kind of crude parody of the Trinity. To those with whom these spirit-entities communicate, they claim to be acting in the higher interests of humanity by guiding scientific discovery and socio-political events. Their advocates openly admit that their main objective is the formation of global religious cooperation and a corresponding form of international government, which will be guided by a “world teacher” who was predicted to come “towards the close of the 20th century.” In terms of their worldview, this will constitute the commencement of the Aquarian Age – the New Age. These “ascended masters” and spirit-guides are currently disseminating their world goals and directing the New Gnosticism through a number of International “Centres of Light,” mentioned in a previous article. 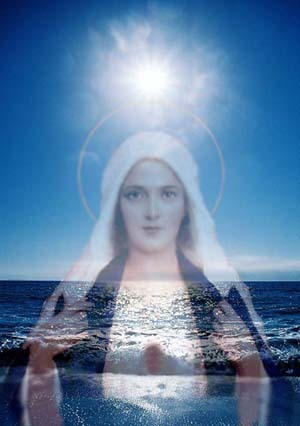 Some groups also claim that Mary, the mother of Our Lord Jesus Christ, is one of the “ascended masters” who is transmitting messages of peace on an increasingly regular basis as we draw to the close of one age and move into the beginning of the New (Aquarian) Age . This can explain many supposed apparitions – unapproved by the Church – of the Virgin Mary where she calls repeatedly for the setting-up of a global brotherhood to usher in an earthly reign of peace and justice. On their websites, the occult groups often picture this "master" as she is pictured in Catholic apparitions. Respectable and influential figures are now avidly endorsing contact with such spirits. For example, the knighted occultist, Sir George Trevelyan, has openly championed the theory that Unidentified Flying Objects (UFOs) are part of the work of the “masters” as they direct Extra-Terrestrials (ETs), which have been brought from other galaxies to patrol the “etheric envelope” around the planet and to usher in the New Age on earth. Toward this end, it is important to accustom people to be open to contact with the ETs, who would supposedly be beneficial non-humanoid beings of a “higher evolutionary order” than ourselves. To the Catholic, such ET's are easily identifiable as the product of the satanic world-plan; they are devils who present themselves to install the reign of Satan. I understand why persons like my relative G.L. take their experiences with spirit-guides seriously – if they were not smart enough to stay away from them altogether. Rosicrucian Grand Master John Dee (1) firmly believed that he had entered into contact with good angels from whom he learned advanced mathematical and scientific knowledge. This close contact with angels or spiritual beings is the hallmark of the Rosicrucian. Today, through consciousness-altering techniques, millions of people claim to have received visitations from these spirit-guides masquerading as benevolent spirits, duping their hosts into believing that they are angels serving the higher needs of the Divine Plan. 1. Rosicrucianism is a Gnostic secret society that has a theology built on esoteric principles of the ancient past, which the average man does not know. It pretends to give special insights about nature, the physical universe and the spiritual realm for its members. Its first manifestations appeared in the early 1600s, and it was closely associated with Lutheranism and influential to Freemasonry. Many esoteric and occult societies claim their doctrines originate from the Rosicrucians.